Every Bear Chair product is packaged in a kit. Each kit comes complete with precision cut, sanded and pre-drilled pieces, easy to follow instructions and all necessary hardware for a one screwdriver assembly procedure. 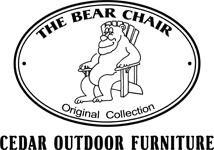 Assembled dimensions: 37" x 33" x 36"
Originating in 1987, The Bear Chair is the leading producer of Canada's ready to assemble Muskoka Chair.